The Junior League of Boise, an educational and charitable group of woman, announced a new campaign on childhoodobesity and nutrition education for this year along with the Treasure Valley Family YMCA. Junior League Boise, along with 230 other Junior Leagues, will put on various “Kids in the Kitchen” events throughout the year to educate children on the importance of eating well and staying healthy. YOUR Boise Hawks got to join in the fun this past Saturday by helping at the West Boise YMCA “Kids in the Kitchen” event. 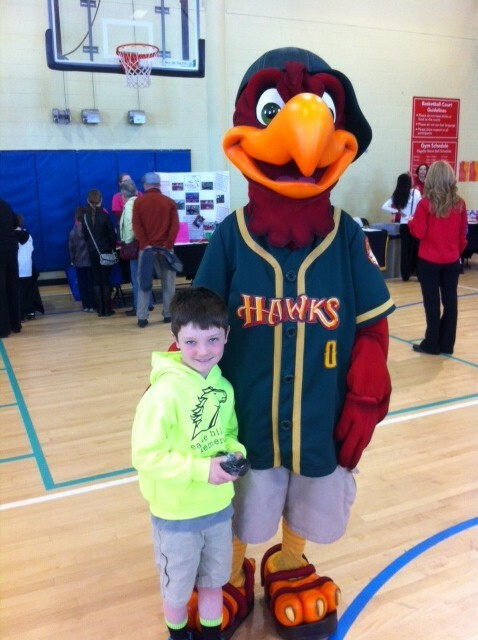 There was free nutritional food, contests, physical activity, and mascots, which is where the Hawks came in! Humphrey the Hawk put on a tee ball demonstration where some kids hit off of a tee while others were fielding the balls. The demonstration ended with a homerun contest with the winner taking home four tickets to a Boise Hawks game. Towards the end of Humphrey’s time there, he was asked to join in a mascot race for the title of Boise’s Fastest Furry Critter and he won! Can’t wait to see you all out at the ballpark! Remember, eat healthy and stay active! It was a great event. Thank you Humphrey and the Hawks for participating! BTW, That is Vaughn Coley (7), son of Junior Leaguer Christina Coley, in the pic with Humphrey.